“Ríos de Sangre”: Título que se le ha dado al tristemente famoso discurso anti-inmigración pronunciado en 1968 por Enoch Powell en el que evocó la sangre en el Río Tíber de la Eneida de Virgilio (Siglo I a.C.). Traducido y adaptado del poema original en inglés, Rivers of Blood, por el autor. Poema publicado por primera vez en ‘Contra: poesía ante la represión’. Coordinadora Anti Represión de la Región de Murcia. 2016. Vuestro presidente Mariano Rajoy y vosotros, con vuestros votos, habéis conseguido lo que casi nadie podía imaginarse que sucedería: la independencia de Cataluña. Hay que ser muy mamarracho y psicópata para mandar a la policía a pegarle a la gente. Ni esos catalanes merecen que les peguen, por muy ilegal que sea el referéndum, ni tiene mucho sentido dar ese espectáculo de sangre y violencia ante el resto del planeta. Se les ha causado mucho daño y sufrimiento a esas personas. El PP y Rajoy han dejado a “España” y al “Estado de Derecho” internacionalmente a la altura del betún y nos están haciendo pasar mucha vergüenza a los que nos consideramos españoles. En estos momentos existe presión para que se reconozca la independencia de Cataluña. Hace 24 horas no la había. ¿Qué ha cambiado? Todo el mundo ha podido apreciar, salvo los que veis TVE y algún despistado en Corea del Norte, lo que ha hecho la policía: más de 800 heridos (cumpliendo órdenes, no culpo a los agentes de Policía y Guardia Civil, que harto trabajo tienen). Ir a poner un papel en una caja no es delito sino parte de tu derecho fundamental a la libre expresión. Lo del 1 de octubre a efectos legales ya no era un referéndum sino una forma de expresarse. No había que “pararlo” porque una vez que no había ni censos verificables, ni garantías, ni reconocimiento internacional esa votación solo era, en nuestro “Estado de Derecho”, una protesta. Ahora, cuando se declare la independencia, habrá un clamor popular en muchos países, aquí en Inglaterra lo hay, para recibir con simpatía a la República de Cataluña. Ahora, por arte de magia, el no-referéndum se ha convertido en un acto de resistencia ciudadana ante la brutalidad de un gobierno y de quienes le apoyan. Ahora, el no-referéndum ha adquirido más valor que un referéndum. Yo he criticado a los nacionalismos abiertamente. No estoy de acuerdo con la independencia de Cataluña ni con este proceso de autodeterminación y así lo he defendido públicamente en mi blog en inglés y donde me ha tocado hablar. Sin embargo, tengo que reconocer que llevaban razón los que auguraban en Cataluña que el referéndum sería el fin de un Régimen corrupto y torpe. Dejaos de concentraciones y de banderas, no alimentéis más las confrontaciones, marchaos y dejad paso a otros. España no os merece. Sad times. Despite having the law on their side with regards to the October 2017 referendum, the Spanish Government of the Conservative Partido Popular (PP) has showed a formidable degree of political incompetence on a number of fronts, not to mention the clumsiness of the police actions. My solidarity goes with all those good Catalans who today suffered from their brutality. As the possibility of a referendum became clearer during 2016, the Spanish Government’s sole reliance on the Rule of Law and law enforcement, legitimate as it might look, became a self-defeating excuse not to deal with the underlying political dispute. When the Catalan Government set in motion its illegal referendum in September 2017, violating even the rules and procedures of the Catalan Parliament, this process of self-determination had gone too far for it to be simply stopped with the intervention of the judiciary and the police. People injured in the streets. Polling Stations shut down by the police. Members of the Catalan Administration arrested and charged with Contempt of Court or Misconduct in Public Office. These scenes are pathetic. A Government should never resort to the Criminal Justice System to deal with an uncomfortable popular movement and with an entire branch of the State (remember that the Catalan Government, autonomous as it is, is also part of the Spanish State). We all know that the referendum is technically illegal. The actions of the Government of Spain in the run up to the vote have already rendered the referendum logistically unfit for purpose. Its celebration has just turned into an act of protest. There is no point in confronting people who want to use it to express their discontent. That is the wrong “policing” approach. It is difficult to imagine why the Spanish Government would have wanted to pursue this suicidal strategy, but we need to bear in mind that the Conservatives in Spain are being sieged by the Spanish Judiciary itself. The corruption cases are far too serious and too numerous. Distracting the attention with Catalonia may prove a last attempt to survive. The recent appearance of enthusiastic unionist demonstrations across Spain where Spanish flags are waived, something quite unusual except for tiny far right groups or anti-terrorist demonstrations, may prevent the loss of votes of the Conservatives amongst their traditional voters, who now see the PP as the staunch defenders of the Rule of Law and the unity of the motherland. The chances of Ciudadanos (“Citizens”, the Catalan-born Spanish party that shares with them the centre-right of the Spanish political spectrum) to challenge PP’s hegemony diminish as voters may prioritise a strong majority government over a divided centre-right in opposition. One factor that must be taken into account to explain the reluctance of the Conservatives to engage with the Catalan issue is the personality of their leader, Mariano Rajoy. Starchy and hard to read, he seems to live on a fence, or rather sleep on it. Some accuse him also of procrastinating, and the far-right call him a coward for not acting more harshly on Catalan independentists, or for not having sent “the tanks” some years ago. A lot of negative energy has been accumulated for several years and, sooner or later, it was going to explode. Obviously, the Government in Spain must go. At the end of the day, it was the Conservative Partido Popular (PP) who promoted, with some degree of success, the annulment of key sections of the enhanced Statute of Autonomy of Catalonia, that had been passed by the Catalan and Spanish Parliaments in 2006. This was a humiliation and a provocation to the Catalan Nationalist parties and to the Catalan Left that changed the course of Spanish politics. Elections should be called in Spain. The PP have disqualified themselves automatically as interlocutors of a necessary dialogue. Alternatively, the rest of parties of the Spanish Parliament should create a provisional coalition government to deal with the situation. PP are in minority, just supported by Ciudadanos. There is no time to waste. In Spain (the territory of the State) we have plenty of nations, almost as many as politicians. Figure 1. Map of the current Estado de las Autonomías, with the borders and flags of the Autonomous Communities. Figure 2. Euskal Herria (Greater Basque Country) stretches over territories of the French State to the North plus Navarre and is the area claimed by most Basque nationalists are their homeland, well beyond the current Autonomous Community of the Basque Country. And the so-called Països Catalans (Catalan-speaking countries), an idea that was made popular in the 1960’s, a cultural and linguistic nation that for the main Catalanist parties in Government is seen in the long-term as the true political subject of a future Catalan State. Mainstream Catalan nationalism, in power from 1980, has assigned to this nation a wide territory that comprises not only Catalonia but also the current Autonomous Community of Valencia (Alicante, Castellón and Valencia itself), the Balearic Islands, the French region of the Roussillon, a city in Sardinia, Italy, etc. Interestingly, bilingualism (Spanish or French or Italian and Catalan is the norm in those places. (figure 3). For Catalan nationalists, the political integrity of this “cultural nation” is a very vivid aspiration. Their parties and, even the Catalan Government, promote pro-Catalan groups and national ideology in those territories whose population, largely pro-Spain, regards this movement as a sort of intrusive cult. Figure 3: The Catalan Countries, the homeland of most Catalan Nationalists. Spaniards do not have a default smaller “core” nation where to place their identity and historical references if the Spanish State, which is seen as their political expression of that nation, were to break up. Regional identities do not stretch so far in most places so as to become “national”. In the Island of Great Britain, we have three recognisable nations (England, Wales and Scotland) which pretty much have territorial and cultural stable references. If Scotland were to break up, English people would always have England as a nation to venerate. Nations in Spain, however, are a different species all together, not just because of their overlapping and almost phagocytic nature, but because all the existing versions of the Spanish nation encompass the land and the population of the Autonomous Communities of Catalonia, Galicia and the Basque Country. The first legal formulation of a Spanish political nation whose sovereignty resided not just in the monarch but in its people, came about in the liberal Cádiz Constitution of 1812. Those “national statements”, passed by the Assembly of notables from the whole of Spain, predate the claims for modern nationhood of the rest of the nations in the Spanish territory, which can be traced back to the last third of the 19th Century in the form of initially minority regionalist movements. I am not denying that the Principality of Catalonia, as well as the Kingdom of Aragón, the Kingdom of Valencia and the Kingdom of Majorca were distinctive political entities, some claim sovereign, before 1714 (The end of the War of Succession). I am not denying the fact that Catalan was the autochthonous language of three of these four territories. I am simply stating that there was not ever a Spanish nation, as a modern political formulation, that did not include the abovementioned Iberian territories. When the Cortes de Cádiz declared the Spanish nation in 1812, there was not another group of notables in Catalonia with a gathering and a programme remotely comparable to that of Cádiz at all. It is precisely because of this that the Spanish project as a nation-state grew the way it did, with all its imperfections and divisions. As a result of it, nowadays, for a majority of Spaniards, the territories of Catalonia, Basque Country and Galicia, are an integral part of their nation, as a cultural and historical representation that they feel emotionally attached to. We can think of many different formulae to make State boundaries and national boundaries to reflect better what happens in life and politics. For instance, I could envisage an independent Catalonia where the Spanish nation is also recognised by a Catalan constitution as overlapping with their territory. At the end of the day, the majority of Catalans (still) have a dual national identity (Catalan and Spanish). However, in the current scenario this rosy solution is very hard to imagine. Nations are, primarily, emotional constructs, deeply embedded psycho-social phenomena. Unfortunately, media, politicians and the education system in Catalonia have not done much to prepare the terrain for a seamless future. Quite the opposite. In the last 35 years, the Government of Catalonia, that has been ruled one way or another by parties with a nationalist agenda since 1980, has engaged in a nation-building programme that involved, controversially, representing Spain as an external enemy of the Catalan people, whose spirit and institutions had been allegedly defeated by a military prone Spanish State. These educational efforts were accompanied by the fostering of a popular culture of Catalan national distinctiveness by nationalist politicians and public figures that relied often in the worst of bigotry. I am not denying the friendliness and tolerance of the majority of Catalans I have come across in my life, but as much as I love my friends who live there, many of them in favour of the referendum, I would like also to tell them that Catalan voters should not have backed time and again the two political parties that harboured anti-Spanish bigotry since 1980, which are the current parties in Government in Catalonia today (hopefully for not much longer): ERC, Esquerra Republicana de Catalunya (Republican Left of Catalonia) and PDeCat, “Democratic” Party of Catalonia, formerly Convergencia. “The Subsidised Spain lives off the Productive Catalonia”, explains one of these posters. This is replicated in demonstrations and popular discourse. Spain is robbing our money. Anarchic Andalucians lay idle and live in spiritual, moral and cultural misery. We are more like the French. I would not like to see someone with a non-Catalan name as the President of the Government of Catalonia. You are only Catalan if you are born here. If you speak Spanish, you are a coloniser. Being Spanish and being a thief is the same thing. These are some of the statements made by politicians and public figures in the video, in a more elaborate and inflammatory way. Sadly, this persistent abuse has not been publicised and denounced widely throughout all these years. There was a sense of guilt in Spain about Franco’s cultural and political repression that prevented anyone in the Left and the Centre of politics to take issue at Catalan abusive nationalism in public. Catalans nationalist politicians were allowed to insult, probably because their outbursts were perceived as a form of legitimate catharsis or revenge against Spanish right-wing nationalism. For as long as these vociferous members of those parties respected the constitutional frame of 1978 and kept playing ball in the Spanish institutions, they got away with it, as if it all were just an extension of Real Madrid-Barca banter. If anyone in the Left or Centre of politics raised the issue of school and media brainwashing, or the insults, s/he would be accused by Catalan Nationalists to play into the hands of Spanish right-wing commentators, who, vile and despicable as they may be, were the only ones who denounced with some conviction these abuses. Whilst the majority of Spain children have been learning at School since the 1980’s the 1978 Constitutional creed of a diverse pluri-cultural Spain where regions and “nacionalidades” (a term used by the Spanish Constitution -“nationalities”- in reference to Catalonia, Galicia, Basque Country and any others) lived under a revamped peaceful and democratic umbrella, in Catalonia, text books and media were offering a version of their “nation” that was rather less appeasing. I have to recognise that the most recent discursive formulations of the Catalan national project, in the last 5 years or so, are much more intelligent than their predecessors’, as it can be appreciated in the words of Junqueras in that video, when he addresses this question. Currently, there is a concerted effort among Catalan Nationalist top politicians to offer some friendliness to Spain which has to be welcomed. This has allowed the pro-independence cause to grow in numbers, as many of the Catalans who support the referendum and independence are the children of Spanish migrants who went to Catalonia in the 1950s and 1960s. Nevertheless, I dare to say that most Spaniards outside Catalonia do not really believe in the sincerity of this calculated change of emotions by the Catalan nationalist (populist, in the worst sense of the word) politicians. The damage has been done already, both educationally and in terms of intercultural relations. The politicians and public figures who appear insulting Spaniards in the video are very much in the driving seat of the current “Process”. The intervention of the Government of Spain in the referendum, and the popular reaction of some sectors of Spanish society in support of the Spanish police forces, is certainly going to make it even harder for people to deal with their differences. Now that the gloves seem to be off, courtesy of Catalan Nationalism and the Conservative Spanish Government, both to be blamed for the current stalemate, I am not sure how much can be reasonably done for the sake of mutual understanding. The current Catalan Government, sustained by the coalition Junts Pel Sí (Together for Yes) includes, alongside the moderate left-wing ERC, the Conservative-liberal PDeCat. This party, like their State-wide Conservative PP Spanish counter-parts, is riddled with corruption. They have been a dominant force in Catalan politics for decades and now the Courts of Justice are acting upon their abuses whilst in power. The extremely confrontational attitude of PDeCat, who has only embraced independence demands over the last 6 years, was a result of their electoral decline provoked by corruption scandals, as much as a strategy to force the Spanish Government to negotiate concessions for Catalonia. As their strategy failed and the Spanish Government called their bluff, PDeCat could not be seen blinking on the question of the referendum. One factor that accelerated the triggering of the referendum was the weakness of the minority Junts Pel Sí government in Catalonia. For them to pass the budget and all the legislative projects of the Referendum and Independence Process they needed the support of the radical left anti-capitalists CUP, who certainly do not see the referendum as a simple bargaining chip, as they believe that Catalonia’s independence is the start of an anti-capitalist grass-roots revolution. It is the CUP who precisely have made the referendum unavoidable, as they are propping up the Junts Pel Sí coalition on that condition. Moreover, in the tradition of PDeCat, there is no other scheme of relations with Spain than “bilateralidad”. They have no intention to engage in an exercise of State engineering, like their predecessors did, exceptionally. Convergencia’s (now PDeCat) Miquel Roca i Junyent participated in the Constitutional drafting group, made up 7 Spanish MPs that made possible the 1978 agreement. The Spanish Constitution of 1978 received overwhelming support in Catalonia partly for that reason (91%+ of affirmative votes!). I believe in the need of a social and cultural revolution to deal with the failure of capitalism. I personally would defend a referendum on things like nationalisation of public utilities and key industries, for instance. But this Catalan Process, has little to do with anti-capitalist aspirations, as the CUP would like to think. It is a shame that left-wing activists who defend a no-borders approach to humanity and the unification of the working classes are wasting their energy in dividing people and playing a chess game by proxy, in the hope that the chaos brought about by the referendum will help them to spread their revolutionary message and over-throne the capitalist system. I think they are absolutely deluded. Look at the example of Brexit and “Lexit”: Where is the left-wing ingredient of Brexit in the current negotiations with the EU or in the dominant media and public opinion? Pathetic. I was recommended to read a Spanish intellectual called Joaquin Nim who theorised in 1934 about how working-class movements could be built on the back of nationalist movements and I really did not have the energy to finish reading such a flawed article. Chaos benefits those who hold an alternative power, cultural and political. The alter ego of the Spanish State is not a democratic paradise of equality and socialist emancipation, but a Catalan Switzerland (or a Catalonia with the tax advantages of the Basque Country), as dreamed by many right-wing Catalan independentists, a Catalan Sweden, as per the aspirations of the more left-wing ERC or, hopefully not, a Catalan Bosnia. Whilst I feel uneasy about politicians been arrested for organising a referendum, even though it is illegal, and I feel very strongly about the use of police force against innocent voters/protesters, I clearly would applaud the imprisonment of all the Catalan public figures who have incited anti-Spanish ethnic hatred. They have had a hand in this intercultural disaster. We now have different groups of well-intentioned, not so well-informed, citizens trapped in overlapping, sprawling, imperfect “nations”. Democracy has been fetishised around this Catalan referendum, a totem which, to me, is not the start of a democratic revolution but the end of sad story. When I saw the President of Catalonia in a recent interview with Al-Jazeera blatantly lying about some key, uncontroversial facts, just for the sake of effect, in front of an unprepared journalist, I could not avoid feeling despair. The same happens when I see people from Catalonia passionately wanting to take their country back. Like in Brexit, the Catalan Process responds very well to a perverse global tendency: one-off disposable democracy, fake news, identity politics and insults. I recognise the right to self-determination of peoples, but who is, emotionally and politically, entitled to decide in Catalonia, which for most Spaniards is inhabited by members of their own people, their own nation? What types of majorities would you need in Catalonia to support independence? It is time for both Governments, the Spanish and the Catalan, to resign and let other parties to take the lead and look for a long-term solution to all this. Both PP and Junts Pel Sí have pushed us all into this sorry situation with their blind populist pride. The European Parliament should investigate all abuses, including media abuse and indoctrination, and mediate. Meanwhile, people need to calm down. Mutual trust has to be rebuilt. I suggest that we all post in social media one thing that we like of Catalonia or Spain every day. Despite my bitterness in this article, I get quite emotional when I think about friends there and the good times I always had in Catalonia. I now expect fanatics and radicals, some more polite and educated than others, from all sides, Russian trolls, Little Spanish Francos, Catalan Cyborgs and Assanges to call me all sort of names or even ban me. If they bark, we must be riding. Regrettably, as we speak, the first arrests resulting from the confrontation between the Spanish State and the Government of Catalonia are taking place. Public officers of the Catalan government will soon be charged. Nobody can question, legally, that these officers appear to have committed a criminal offence. They are acting against legally binding resolutions by Spanish judges that are technically legitimate. The resolutions adopted by the Catalan Government in order to initiate the referendum have been declared illegal. They are not only in breach of the Spanish constitutional system. They are even in breach of their own rules in Catalonia. The motion passed by the Catalan Parliament in support of the referendum did not respect their own laws, as I explained in my previous article. The Spanish legal system, similarly to the UK system, regards the breach of a legal duty by a public office as a criminal offence. Over here is called “Misconduct in Public Office”. I don’t think the arrests are part of a campaign of arbitrary police repression. Everyone knows that the Government of Spain is under fire, nationally and internationally, for its inability to deal with all sorts of Catalan political demands in the last decade. The eyes of all commentators in the world are cast on these arrests. That is why I am sure the police and the public prosecutors will act not only proportionally and humanly, but exquisitely. Any allegations of brutality would give strength to those who want straight independence and the Spanish Government, politically clumsy as they may be, are not stupid. The intervention of the police, confiscating databases and documents that are essential for the celebration of the referendum will most likely render it impossible to hold. Also, as we speak, people in Barcelona and other places are peacefully demonstrating against the arrests, demanding a referendum. The calls for peaceful demonstration and non-violent resistance by Joan Tardá (ERC) this morning suggest that there is a fear that some smaller groups may want to use the public uproar to justify less-than-peaceful actions. The whole situation is utterly lamentable. Millions of people in Catalonia have been exposed to hard anti-Spanish propaganda by their Government. “Spain is robbing us” was one of the most popular claims of activists in Catalan nationalists parties. They are understandably upset and furious. Meanwhile, a high proportion of Catalans experience political disempowerment in silence. In the last elections the majority of voters opted for parties that do not support independence. These pro-independence parties have a majority of seats but not of votes. The case for independence made by mainstream Catalanist parties is based on distortions of history and political interests of the lowest kind. I cited a recent example in my previous article of blatant historic manipulation and explained that independence is being used as a political tool. This is irresponsible. And so is the whole policy of the PP, the Spanish Conservatives, who not only torpedoed the revamped 2006 Catalan Statute of Autonomy, but failed to make a meaningful case for public support of unity of the Spanish State in Catalonia. Nor they considered dialogue with Catalan Governments and other Spanish parties. Their perverse strategy could be summarised as this: relax and Laissez-faire because if things turn nasty, the Rule of Law is on our side. On the positive side, yesterday, a motion by the Ciudadanos (Citizens) party, who are strongly against any referendum and defend the constitutional unity of Spain (interestingly, this is a Catalan-born party and its leader, Albert Rivera and its main political figures are Catalans) was defeated in the Spanish Parliament. Ciudadanos wanted Spanish MPs to vote in favour of a declaration of support of the Spanish Government and all the public officers dealing, in one way or another, with the referendum, including those majors in Catalonia who are not facilitating the preparations for the referendum in their local authorities and are being pressurised by vociferous pro-independence groups. The reason why the motion was not passed is that PSOE (Socialist Party) voted against it. The Socialists had suggested an amendment to the motion whereby a paragraph calling for both the Spanish and the Catalan Governments to open a dialogue was to be introduced. Ciudadanos rejected the amendment and they, alongside the Conservatives, PP, were consequently defeated. The majors of Barcelona, Colau, and Madrid, Carmena, are calling for dialogue. The Socialist PSOE have accepted to be part of a parliamentary commission, proposed by left-wing Unidos Podemos, in which Catalan political parties would obviously participate, that would consider the options ahead and initiate a mature conversation. Now that the referendum game seems to be over, there will have to be elections in Catalonia. It is almost inevitable. It is time for a new concerted progressive action in the Spanish Parliament, where the minority Conservative government have to rely on Ciudadanos and, interestingly, the Basque Nationalist Party (PNV) for approving their budgets and pass major laws. My biggest concern is to do with public perceptions and emotions. Think about ardent Brexiters in Question Time and their heated rhetoric and arguments. Who will explain now to their Catalan equivalents, the “Catalexiters”, that the Spanish State does not really steal money from Catalonia? That independence would not actually bring back all those millions a week to their pockets. That sovereignty in the 21st Century is better exercised in a federal way. That Spain is not a Francoist creation, a historic evil monster of warriors and ignorant peasants who live off laborious Catalans. Who will tell them that for most Spaniards Catalonia is also part of their “Spanish Nation”, as much as for many Catalans the province of Alicante (strongly pro-Spanish, in the Valencia region) is also part of their “Catalan nation” (This is called the Catalan Countries)? After a relentless cultural campaign of perverse Catalan nationalism over the years, a lot of hard work to appease and educate is needed. On the Spanish side, who will be able to persuade those fervent centralists, who wish for the abolishment of the current federal structure of the Spanish State, that Catalonia is, as I believe it to be, also a nation? That nations overlap. They have been also intoxicated by Spanish nationalist right-wing propaganda. To me, there is an urgent need to increase grass-root educational efforts at all levels, promote alternative media and preach tolerance whilst being open and determined about the distortions and lies of elites of nationalist politicians who are to blame for all this. The Catalan Countries overlap with other historic and political territories, mainly in Spain and France, extending well beyond Catalonia. Bilingualism is the norm in all those places. A complex set of variable multilayered national-regional identities and loyalties populate those territories. Madrid is robbing us. Spain is robbing us. The subsidised Spain lives off productive Catalonia. propaganda from the two main parties of the current Catalan Government, plus newspaper cover. 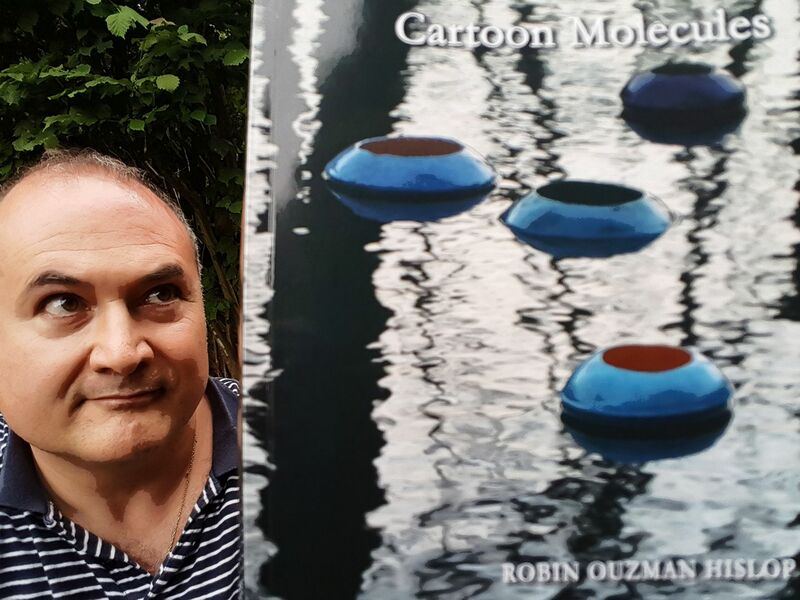 Cartoon Molecules (Lulu, 2017) is a brave philosophical and poetic exploration of humanity and the universe, advancing theories of time and space and technological utopias as well as questioning the singularity of humankind.